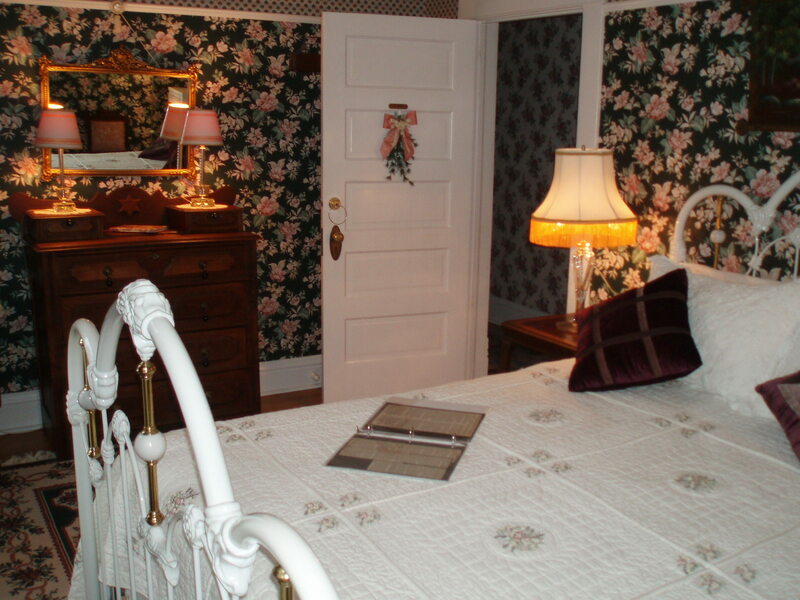 Here are links to the guest rooms at Dreams of Yesteryear. 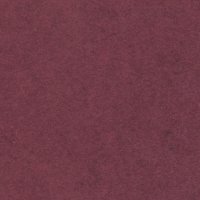 The room rates are found on the pages for the individual rooms. On the right you can see the amenities included with your stay. This spacious and comfortable suite is located on the third floor of the house. The third floor was intended by the builders of the house to be a ballroom, hence the name of this suite. The Ballroom Suite includes a queen-sized bed beneath the cathedral ceiling, a private bath with a whirlpool tub and shower, and a sitting area. Here are some of the amenities and features included to make your stay even more enjoyable. All the guest rooms are centrally air conditioned. The rooms are decorated with antique or reproduction furniture. Wireless high-speed internet is free to guests. Don't worry, they aren't antiques. Digital (and reliable) alarm clocks are included in your room. A scrapbook containing articles on the history of this Victorian home has been placed in each room. A full Gourmet Breakfast is included with your stay. The Heritage Suite is located on the third floor. Its decor includes memorabilia and historical items from Stevens Point and Portage County, giving you a chance to reflect on what life was like in days gone by. The Heritage Suite includes a queen-sized bed, a private bath with a walk-in glass-walled shower, and a sitting room. The Isabella is a spacious room located on the second floor. 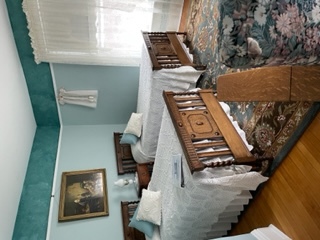 The Isabella room has a queen-sized bed and a private bath featuring a clawfoot tub with a brass shower ring. The "Flo" as we affectionately call this room, is a brightly lit space with windows overlooking the gardens. 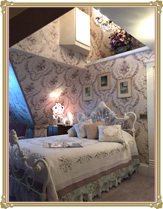 The Florence Myrna Room has a wrought iron queen-sized bed and a private bath with a neo-angular glass and ceramic walk-in shower..
Gareld's Room is located at the very front of the house on the second floor near the balcony. It has oak twin beds that can be converted into one king-sized bed. Gareld's Room shares a first floor bath with one other room. Robes are provided. Don't worry, we won't make you clean if you stay in this cozy room. The Maid's Quarters has a double-sized bed and shares a first-floor bath with one other room. Robes are provided.